For a landlocked child growing up in the Midlands, Skegness was a paradise. More quaint than Blackpool and more of a laugh than the nearby Gibraltar Point or serene Sutton-on-Sea; better even than Fantasy Island. As an eight-year old, I found it impossible to believe Skegness was actually a functioning town where real people lived. To me it was a constant party hub which never closed. A sugared donut-filled dream of sand and slot machines. 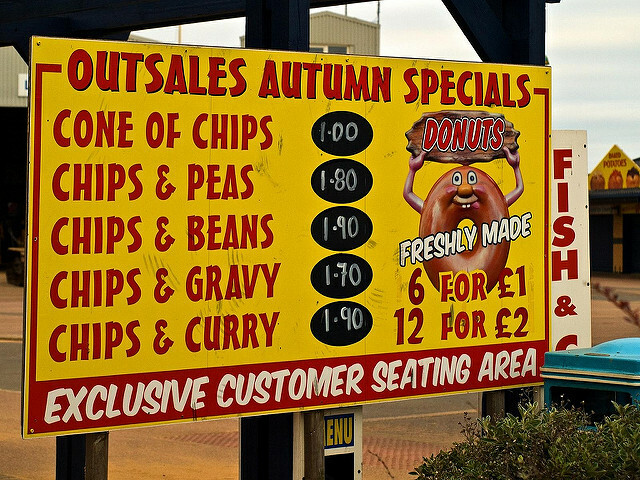 A place where you could survive on a diet of chips and still buy a hot drink (you needed it) for 50p. Skegness was a formative part of my youth, even if the ONS did call it “the most most deprived seaside area in England”. As much as it hurts to admit it, childhood wouldn’t have been the same without weekends in “Skeggy”. This was the very first and very last place you’d go, largely because it was placed next to the car park. 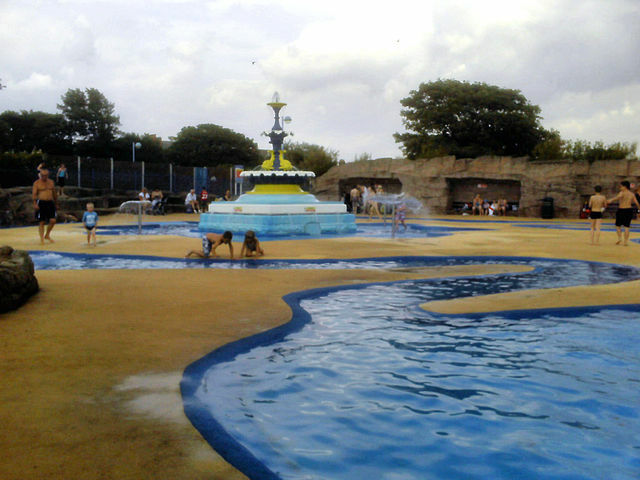 But the smell of the sea and the shot of chlorine seeping from the Fairy Dell were undeniably exhilarating. These were simpler times, before we were old enough to go on any of the rides, and instead jumped across the little ponds and danced under the fountain – which was already showing signs of cracking – and getting in arguments with other kids. Better times. Remember this guy? Unhealthily round, wearing a bright red scarf and with a pipe permanently slotted in his mouth? 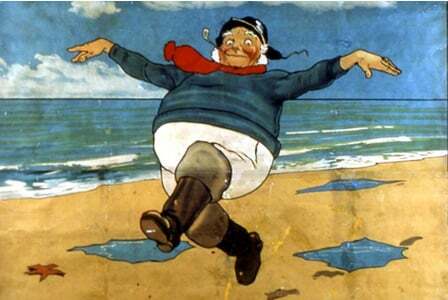 He was plastered over every postcard, keyring, mug and road sign once you get onto the Skegness strip. Believe it or not there were cries from animal rights charity PETA to change him to a happy fish. The slogan was going to be changed to “A Happy Plaice” instead of something about how bracing the weather gets over there. Whether or not you agree the Jolly Fisherman is a cold-blooded killer, he was a part of the Skeggy landscape. Skegness is always hoodie and raincoat weather, even in summer’s muggy heights. This is not the glorious coast of Cornwall or Dorset: we’ve got our distressed Lincolnshire riviera, and that’s how we like it. As a child, the beach was never my highlight. I wanted to play mini golf, go on the pirate ship and throw chips at seagulls. If you’ve ever taken a paddle in the North Sea without flinching and stating the obvious (“ooh it’s cold”) then you’re a stronger man than me. 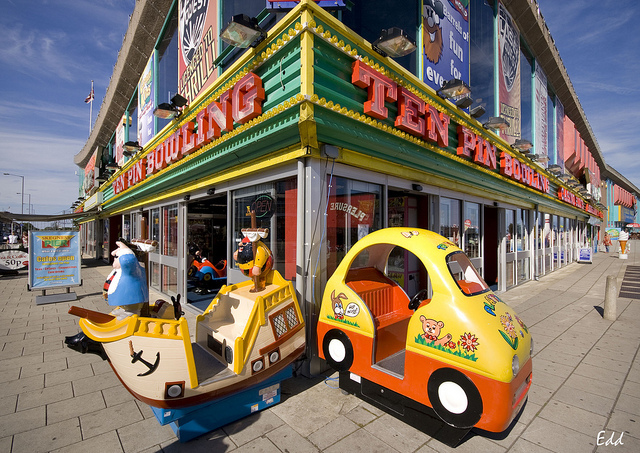 Skegness had a way of getting us hooked early, 2 pence at a time – there’s a reason (some) people call it Skegvegas. 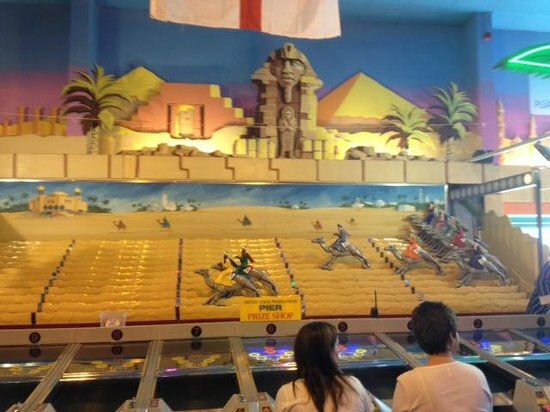 That addictive little tune they played at start of the camel race; the persistent and regrettable middle-aged figure on the microphone encouraging us to get the balls in the holes quicker; to kids who were yet to hit puberty, prize tokens were like crack. And they didn’t even try to conceal the fact that it was gambling for under 18s: the shiny roulette machine in the centre of main room said as much. It’s troubling to think how much birthday and Christmas money was broken up into small change for the sake of a Looney Toy or the dream of a knock-off iPod mini. If you were in it for the eternal glory and not the petty cash prizes then there was always the dance mat game towards to exit to the pier. I went on it once and some local girls laughed at me. Well that’s not strictly true, there are a couple of other chain food outlets, but you didn’t go all the way to Skegness to have McDonald’s. It was the final part of any good day out in Skegness. Just don’t ask for the vegetarian option. 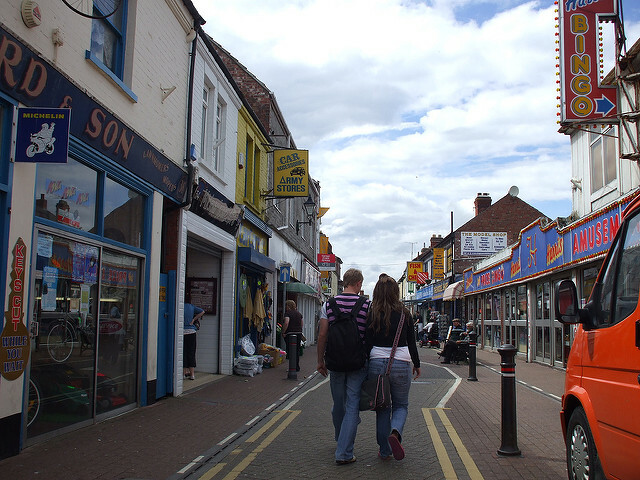 Skegness is home to the lovingly named “Chip Pan Alley”. Every other shop claims they have the best fish and chips on the east coast. It’s name is part self-explanatory description of every single thing you can buy along there, and part homage to the smell of cooking oil. I remember hearing one particularly demanding customer insist that his chips were prepared using Lincolnshire potatoes and cooked so they’re still white. As if they would be cooked any other way. I never got to stay in a caravan, but we did spend a night in one of those seafront hotels, right in the heart of the action. To this day I’m still not convinced the guy who showed us round wasn’t Jeremy Beadle. Something about Skegness never changes. It’s like walking into a Martin Parr-esque vision of regional England circa 1991, and there’s a certain beauty in that. A few years ago a portion of the whole seafront dramatically burned down, but they built it back exactly the same. This is a coastline untouched by metropolitan life, ironic Ugg boots and kale. 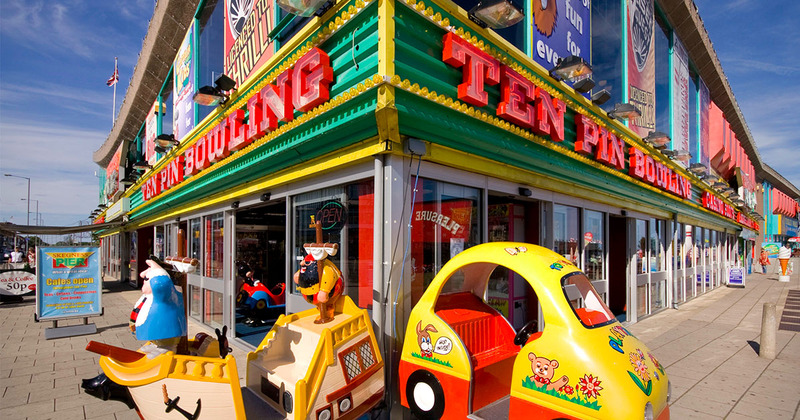 Modern touches have come in the form of a seal sanctuary and modernised fairground rides, but it’s still the same Skegness and that will never change.